The body launched to tackle the UK's most serious crimes will "relentlessly pursue" those responsible, Home Secretary Theresa May has said. The National Crime Agency - dubbed "the British FBI" - will tackle organised and economic crime, border policing, child protection and cyber crime. Labour said it was a "rebranding exercise" that did not "live up to the home secretary's hype". On the day the NCA was launched, Mrs May also revealed the government's serious and organised crime strategy, which includes plans to ensure criminal assets cannot be hidden by spouses, that assets are frozen earlier and that prison sentences are increased for criminals who fail to pay confiscation orders. The National Crime Agency, with its budget of close to £500m a year, will lead the fight against the estimated 37,000 criminals involved in organised and serious crime in the UK. It replaces the Serious Organised Crime Agency, which was formed in April 2006. The NCA, which will work with regional police forces in the UK and similar organisations abroad, will have 4,500 officers and aims to adopt a more visible, joined-up approach than previously. In the first operation led by officers from the new agency, five people were arrested in morning raids in Warrington in Cheshire, Bromley in south-east London, Brentwood in Essex, Troon in South Ayrshire and Liverpool. Mrs May said: "We're taking a wholly new approach to the fight against organised crime. "The NCA will be looking at a wider range of organised crime and working with police forces and others across government in addressing this pernicious problem in our society. This is the third attempt to create a British FBI in 15 years. There is no new money. Some of its officers in their new black NCA jackets told me they'll be doing the same job they've always done. The top cops at the NCA stress it will lead the national fight against crime, not simply sit alongside existing policing operations. They talk about the way intelligence from lots of sources will be combined for the first time and new powers will be used to task police forces to act. NCA specials, non-police officers with specialist skills, will be recruited from the private sector. But one aspiration stands out. The NCA promises to be much more transparent than the Serious Organised Crime Agency (Soca) - an organisation that didn't even put its name on its buildings. The new agency will trumpet its successes, and fight for its reputation. Which might mean it has a better one. "We will be ensuring the relentless disruption of organised criminals." Mrs May confirmed there would be a review to examine whether counter-terrorism policing functions should move to the NCA in the future. 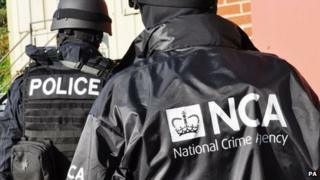 The agency's head, Keith Bristow, said that, unlike Soca, it would not be a covert organisation and some officers would wear clothing bearing the NCA logo when on operations. "We are going to make a difference the public will see," he told the BBC and warned criminals to expect "continuous disruption", including the confiscation of their assets. But shadow home secretary Yvette Cooper told BBC News that, while the NCA was "important and we wish it well, this is rebranding from existing organisations and, unfortunately, with a 20% budget cut". Shadow policing minister David Hanson said the new organisation was "not strong enough to deal with the exponential growth of economic and online crime". It would absorb the existing national cyber crime unit but with fewer resources, he added. However, Mrs May told the BBC she was satisfied the NCA would be "well resourced", adding that the government had already shown it was "possible to keep up that relentless fight against crime" with less money. Keith Vaz, chairman of the Home Affairs Select Committee said: "The organisations going into the NCA have a combined budget of £812m, yet the new agency will only have £473.9m next year. Media captionTheresa May: "We are taking a wholly new approach to the fight against organised crime"
"The Home Office needs to account for where this money has gone." The NCA will answer directly to the home secretary and will have significant powers to compel police forces in England and Wales to provide assistance and carry out policing operations. It will have a strategic role attempting to look at the bigger picture of organised crime in the UK, how it operates and how it can be disrupted. The situation will be different in Northern Ireland, where the agency will carry out border and customs functions but not other crime-fighting roles. Northern Ireland Justice Minster said the NCA's limited powers in Northern Ireland would place "an additional burden" on the PSNI.